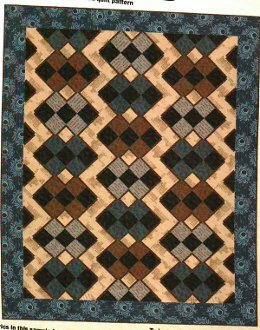 The interlocking 9-patches of this quilt make it look complicated, but it is made up of easy to cut and sew units (squares and rectangles). I call it a plaid ? almost an argyle. The design and color placement on the cover quilt make it perfect for a guy - or change it up with fresh colors for a completely different look. Finished quilt size is 68" x 84"